Japan is without doubt one of the most evocative and fascinating locations for winter wildlife photography. This beautiful country has so much to offer from the iconic Snow Monkeys which warm themselves in thermal pools to the graceful courtship display of the Red-Crowned Cranes. As well as spending a number of days with each of these iconic national species we will work with Whooper Swans set amongst a beautiful winter wonderland landscape and travel by boat into the floating pack ice looking for Stellar’s and White-tailed Eagles. With stunning winter vistas throughout, and other opportunities including Red Fox and Sika Deer, this trip promises to be truly memorable. We have maximised our time at each location giving us plenty of opportunity to really capture the beauty and character from each as they all offer so much, as does the overall experience of travelling in this enchanting country at this time of year. Day 1: A day of travelling as it’s a long overnight flight from London to Tokyo. We will be in touch with the flight recommedations. Day 2: Arrive in Japan and then transfer by coach to the mountain village of Yudanaka near to Nagano which will be our base for the next three nights. We will stop for a light snack lunch on the way and then have an afternoon at leisure to give us a chance to re-adjust our body clocks given the big time differences. Days 3 – 4: The Japanese Alps near to Nagano is famous for the opportunity to photograph the beautiful snow monkeys. The Japanese macaque is a species native to northern Japan, and is the most northern-living non-human primate, surviving winter temperatures of below -15°C. 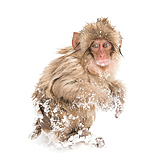 The Japanese macaques at Jigokudani hot springs in Nagano have become notable for their winter visits to the spa. The monkeys spend the day relaxing in the thermal pools to combat the intense cold of the mountains. We will spend two full days capturing this unique behaviour and try to photograph the monkeys with an array of different lenses from wide angles to long telephotos. Day 5: Will have a final morning with the snow monkeys again today at Jigokudani and then in the early afternoon we will head back to Tokyo for an overnight stay at a hotel near to Haneda Airport. Day 6: We will board an early morning flight to the northern Japanese Island of Hokkaido. Hokkaido is the second largest, northernmost and least developed of Japan’s four main islands. Its weather is harsh in winter with lots of snowfall and below zero temperatures. We will be spending the next 9 days exploring this beautiful island and visiting strategic locations photographing some of the iconic wildlife that can be found here. Our first base will be at the Akan crane centre and we will be visiting the centre for an afternoon session of photography en route to our hotel base. Day 7: The red-crowned crane also called the Japanese crane is one of the rarest cranes in the world. In some parts of its range, it is known as a symbol of luck, longevity and fidelity. Japanese cranes, also known as Tancho were thought to be extinct in Japan due to overhunting and habitat destruction. However, in 1926 a group of about 20 birds was discovered in the marshes around Kushiro. With conservation efforts they have since made a dramatic recovery and now number more than 1000 birds. The cranes are spectacular to watch as they dance, often in pairs, with seemingly choreographed dips and jumps. The cranes are best seen in the winter as they gather at winter feeding sites. For these two days here we will be trying to capture images of this beautiful bird at its night time roosting sites and also at the Akan crane centre where the birds are fed on a daily basis. Hopefully with the right weather conditions and if the cranes perform their spectacular courtship display we will be rewarded with some evocative images. White-tailed eagle and red fox are other possibilities at this location as they too are attracted in at feeding times. Day 8: We will spend our last morning with the cranes and it will be an early start as we get ourselves into position at a famous roosting site along a small river. We will then transfer to our next location, which is Lake Kussharo for an afternoon’s photography of whooper swans. Days 9 – 10: Lake Kussharo is a popular stopping point for several kinds of migratory birds in the winter. Kussharo is a caldera lake and it’s fed by hot springs, so parts of it during the winter remain unfrozen. In the fall, large flocks of whooper swans head south from Russia to Hokkaido. Lake Kussharo is a perfect winter roosting spot for the swans. The swans have been fed for many years and so they are very tame compared to other populations. This is without doubt one of the best places in the world to photograph this beautiful species. We will have all of our first day here to explore the lake and try different techniques in capturing images of these graceful birds. On the second day we will transfer to Rausu during the afternoon which will be our base for the next two nights. Days 11 – 12: These next two days will be based in Rausu where we will be going out each morning on a chartered boat. This boat trip will be out in to the Sea of Okhotsk and we will sail into the pack ice looking for Steller’s sea eagles. Each winter, many Steller’s sea eagles migrate from their breeding grounds to the southern Kuril Islands and to Hokkaido, Japan, where food is more plentiful. 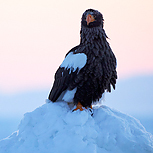 This very large, powerful eagle spends the winter around the coasts or on the pack ice. The birds are attracted to fish that is thrown out for them. This really is one of the highlights of this remarkable trip and we shall be doing two consecutive boat trips each morning to maximise our potential in obtaining images of them in this stunning environment. White-tailed sea eagles are also attracted to the bait so both species will be possible. On the afternoon of the first day here we will travel to Notsuke Peninsula, which is a good place to look for Sika Deer and Red Fox. After our second mornings outings though we will head back to Lake Kusharo where we will spend our final night near Lake Kussharo. Day 13: We will have one final morning with the whooper swans before we then transfer to Kushiro airport for our flight back to Tokyo for our over-night stay near Haneda airport. Accommodation, all transport to/from Tokyo airports and within Japan (including flights to/from Hokkaido and our own private coach and local guide), all meals, entrance fees to reserves, feeding stations and boat trips. International flights to/from Tokyo, alcohol and sundry items. Accommodation is based on a twin room basis dependent on which hotel/lodge we are at during our travels. It will all be typically comfortable Japanese accommodation which will vary between traditional and western style. A limited number of single supplements may be possible so please enquire accordingly. The weather will be very cold and snowy, so suitable clothing/footwear will be necessary. Most of the locations involve short walks only, however there is a 20 – 30 minute walk to the Snow Monkeys which may be icy. Days are relatively short, so not too much of the early mornings/late nights either.